These days, it can be hard to keep up with the current trends of office interior refurbishment DB Interiors is here to save you that stress, while optimising your workspace for both clients and employees. The key note is to get in early to consider your new office design concept. In the modern world the average office worker or corporate individual spends more time indoors than they do outdoors, and that can have an impact on both their productivity and their psychological health. In order to get increased productivity, happy employees, and clients that remember your office space, you need to be able to get as much as possible out of your office interior. To this end, the use of indoor plants and greenery is commonly overlooked. As one of the tools we utilize when designing your optimal work environment, we know what greenery is really capable of, and we think it deserves some deeper investigation. Read on to find out more! Natural light acts as the brain’s signal to engage and wake up, a lack of this has been proven to impact on productivity. One of the practical upshots of adding plants to your office is that it ensures that your office layout and interior design has been structured with natural light in mind. Minimalism as a design trend has been increasing in popularity over the last few years, however there is a significant difference between efficient, aesthetic minimalism, and a bare uninspiring workplace. Staring at the same kind of space for eight hours every day is guaranteed to impact on the inspiration of anyone, so it is important to provide aesthetic interest when considering office design. 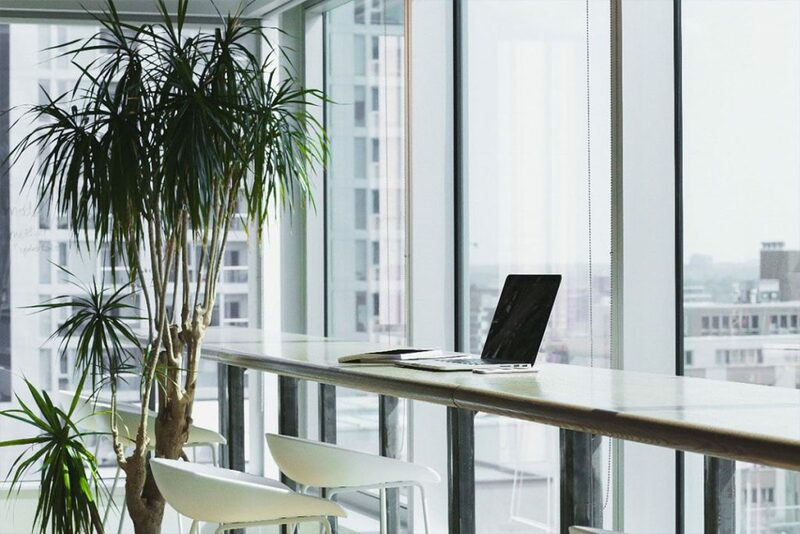 Minimalist offices often fall victim to a lack of colour specifically, which can be easily remedied by the inclusion of greenery in certain spaces around your work space. Productivity can be a difficult thing to facilitate, but introducing small things like this will create a space your employees will enjoy working in, and one that is memorable as professional and open to your clients. The colour green is bright and associated with both creativity and growth, making it an excellent addition to the colour palette in your office. Plants provide a no-hassle way to add colour without engaging in a full overhaul, should you want to keep most of your space unchanged. If you have a new office, take the chance to change the layout from the previous one into something interesting to the eye. Change the way your office looks, and it will augment the way it works. When considering where to place your plants, it is important to remember that they are being used as an accent, rather than a primary design feature. Instead of placing plants on every wall and in every corner, think about where you want to draw focus. Larger plants like ferns work best where they draw the eye to natural light, making your office appear larger and better lit. Smaller plants like cacti and potted colour are perfect for desk spaces or the office kitchen, as they add a pop of colour and interest without distracting employees with a wall of green. Having smaller plants in the places your employees work will also not impact on the flow and efficiency of your office in any way, because no space will be impeded by their inclusion in the décor. If you’re considering changing up your existing space, or if you’re looking for design input for a relocation, contact DB Interiors, your premier provider of office design Auckland-wide.